Planning a Scottish vacation will in the first instance be about choosing specific destinations, booking flights and arranging accommodation. 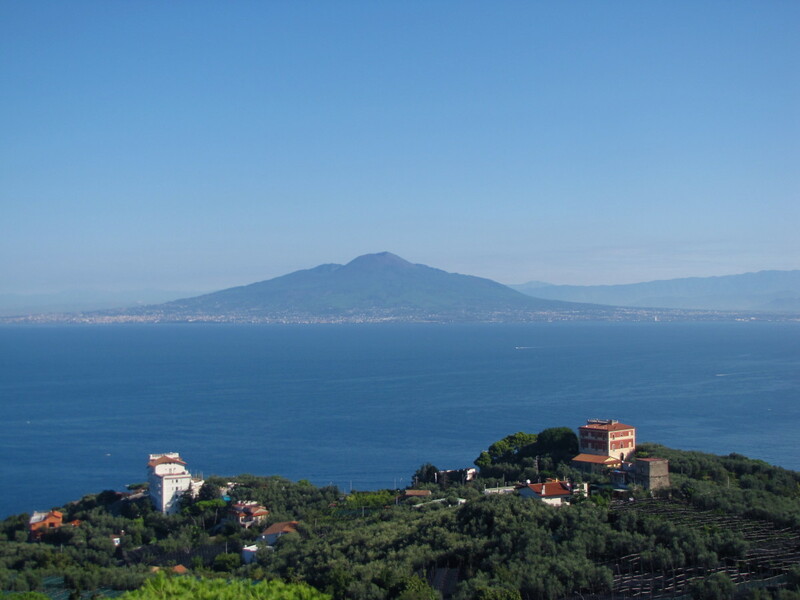 While it is necessary that these be the most important tasks, there are other details which can and should be considered to help your vacation run smoothly and ultimately prove most enjoyable. If you are visiting Scotland on vacation for the first time, you may just have some big surprises in store. 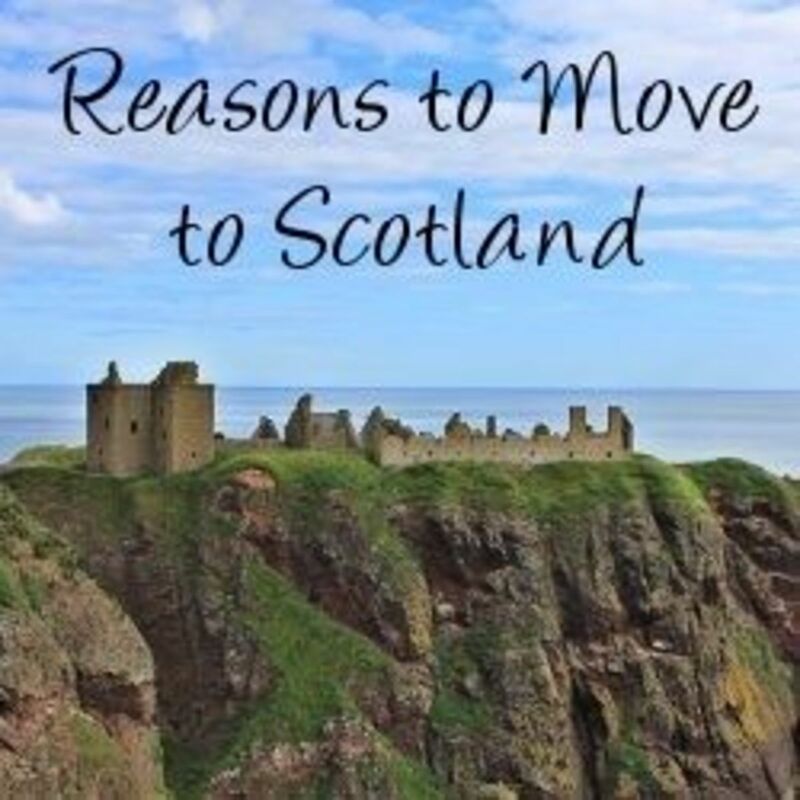 This page is intended as a useful guide for anyone visiting Scotland by going beyond haggis and bagpipes, Loch Ness and Edinburgh Castle, to guide you through some of the mists and myths which so often distort people's perceptions of Scotland. It will focus on useful, practical and cultural information for your Scottish vacation, which you are likely to require on a daily basis. In the first instance, why not take the very quick quiz about Scotland immediately below and gain some idea of how much you already know...? 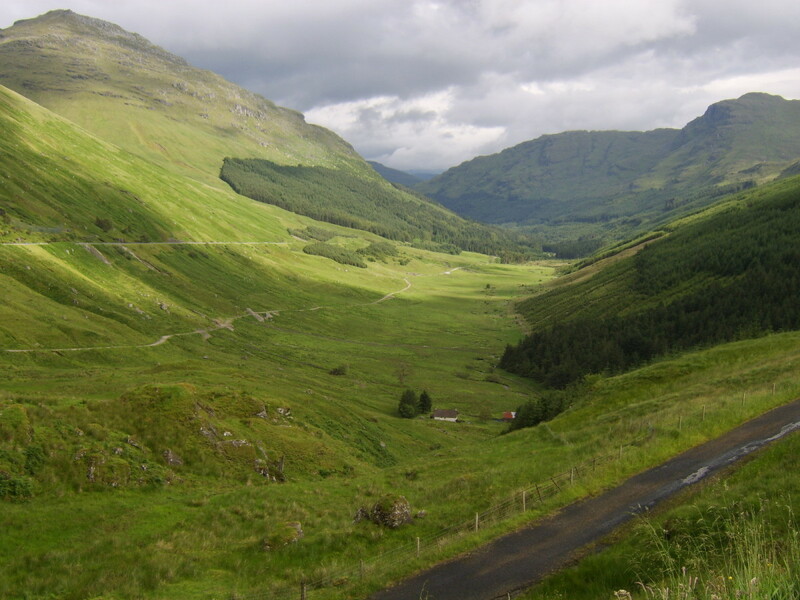 Quick Fun Quiz: How Much Do You Already Know About Scotland? Although you are guaranteed a warm welcome from the people of Scotland when you visit on vacation, Scotland's weather is not guaranteed to afford you a similar greeting. The past few years alone have seen record winter snowfalls and record levels of summer rainfall; they have seen record winter temperature lows and record summer highs. The message is simple: whenever you visit Scotland, be prepared. A couple of warm winter woollies and a waterproof coat or jacket should always be tucked away in your baggage, just in case. When you actually arrive in Scotland on vacation, there is plenty of assistance available at dedicated Tourist Information outlets to help you decide where to visit. If, however, you want to develop at least some idea of the top Scottish attractions in advance of your trip, this excellent book may be the perfect answer. Incorporating quality images, maps and informative text, it will help you to form at least some idea of what you want to see and do in Scotland and may well save you some precious time upon your arrival. You can even take it along with you on your Scottish vacation and refer to the information it contains as you go along. If your Scottish vacation takes the form of an organised package tour, travel and transport will not be an issue. If, on the other hand, you and your family are making your own arrangements, you will need to consider how you are going to get around. 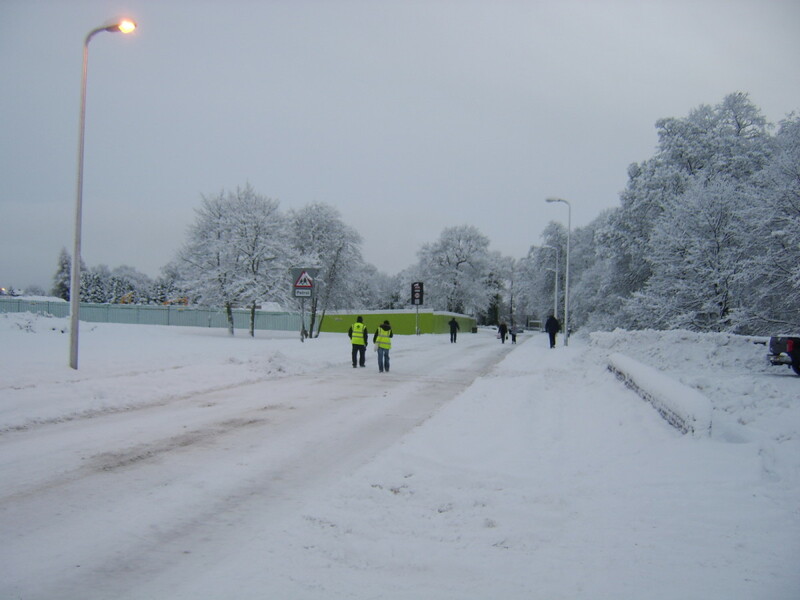 In Central and much of Eastern Scotland (where the major population centres are to be found) public transport is available in the form of trains, buses and coaches, or even taxis. If, however, you are intending venturing to areas such as the Western Highlands and Islands, or much of the Southern Uplands, the same does not apply. The railways in these areas are largely long gone and scheduled buses and coaches are often infrequent. 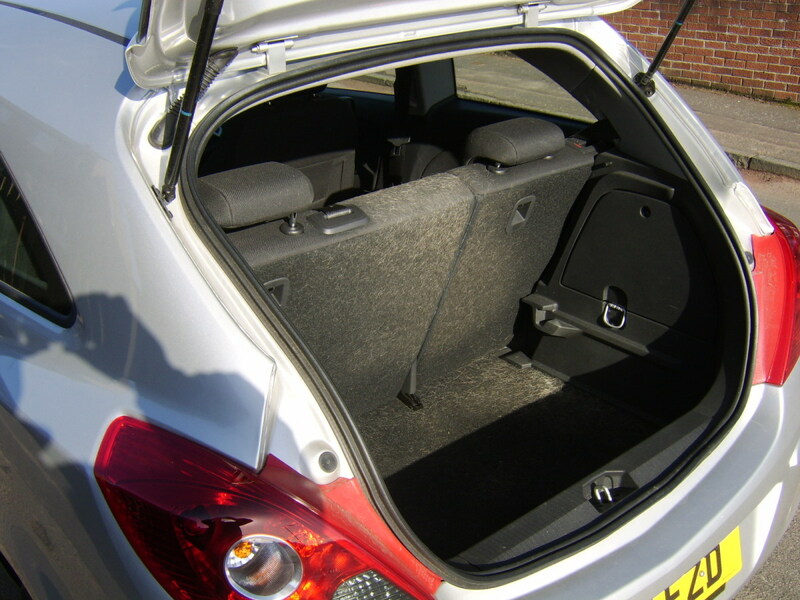 This means that joining an organised tour or private car hire are likely to be the most viable options. Typical petrol (gas) prices in Scotland, March 31st 2011. 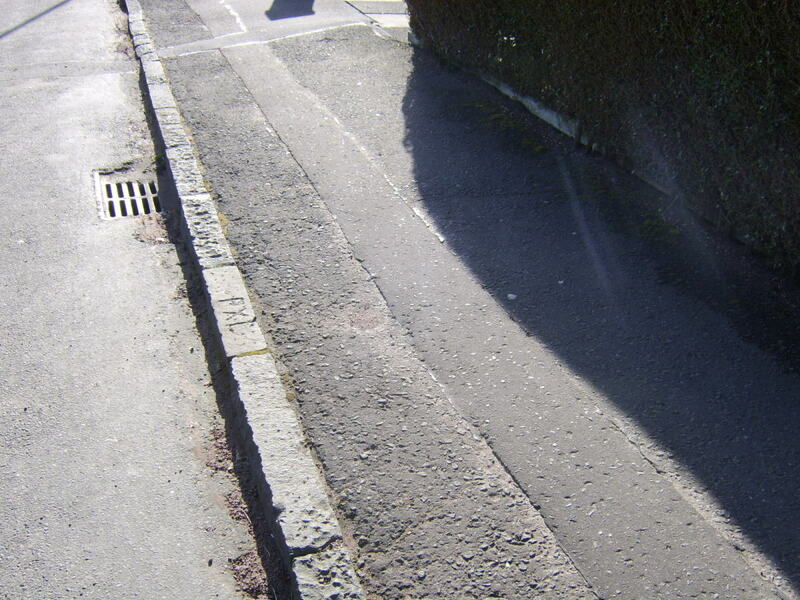 Cars are driven on the left side of the road in Scotland and throughout the UK. 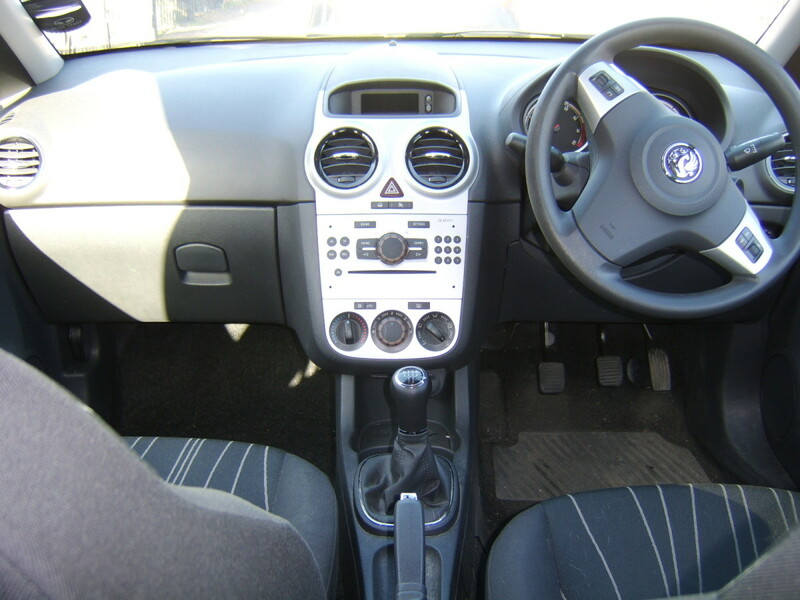 This means that not only may you be driving on the opposite side of the road from what you are used to, the driver's seat will be on the opposite side of the car. Consider whether this is something to which you think you can easily adapt. Petrol (gasoline) prices in the UK are among the highest in the world. This is true of the whole country but if you are heading out in to rural Scotland, the prices will rise further. In such instances, be sure to determine which is the last major town you will pass through on your route and take a few minutes to fill up your tank in that town. 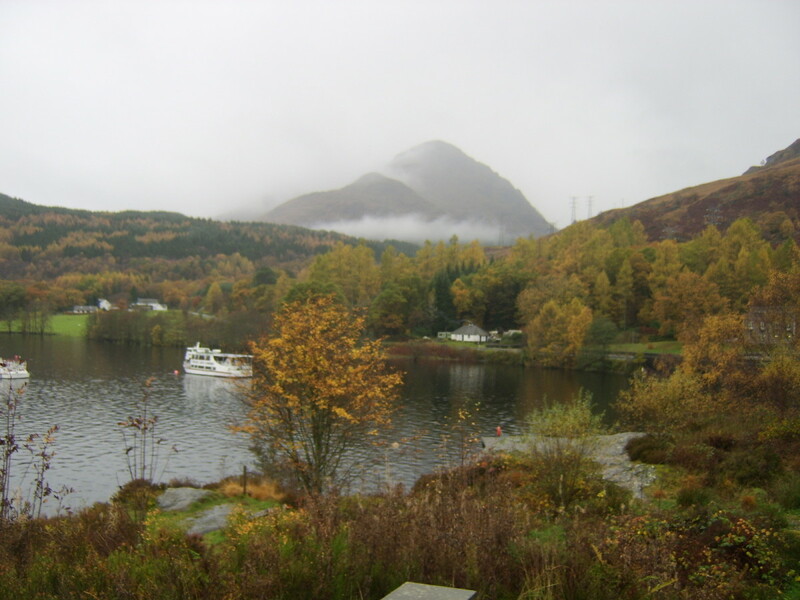 A common example is where you are heading from Glasgow for Loch Lomond and beyond. Fill up your tank at Dumbarton. 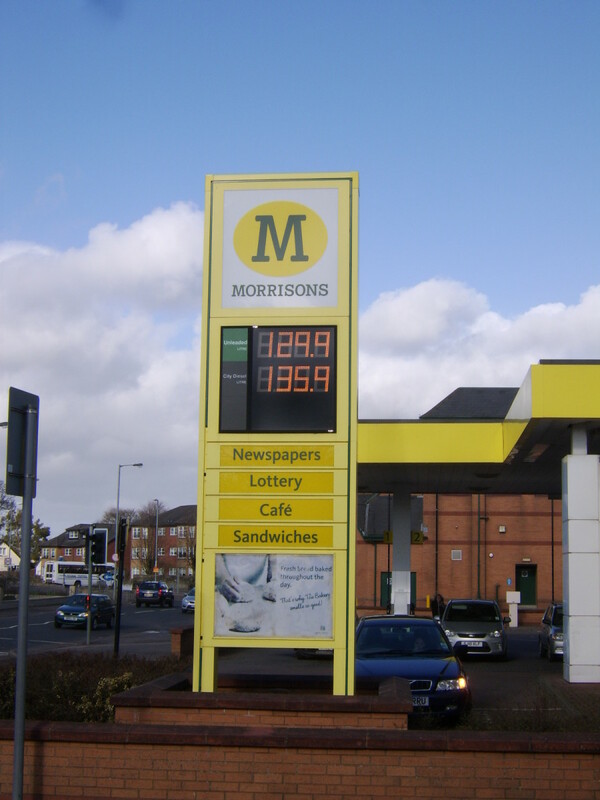 In the example pictured right, the price of a litre of unleaded petrol is £1.299. At the exchange rate on the same day (March 31st, 2011), this equates to $7.87 (US) per US gallon...and this is in Central Scotland! 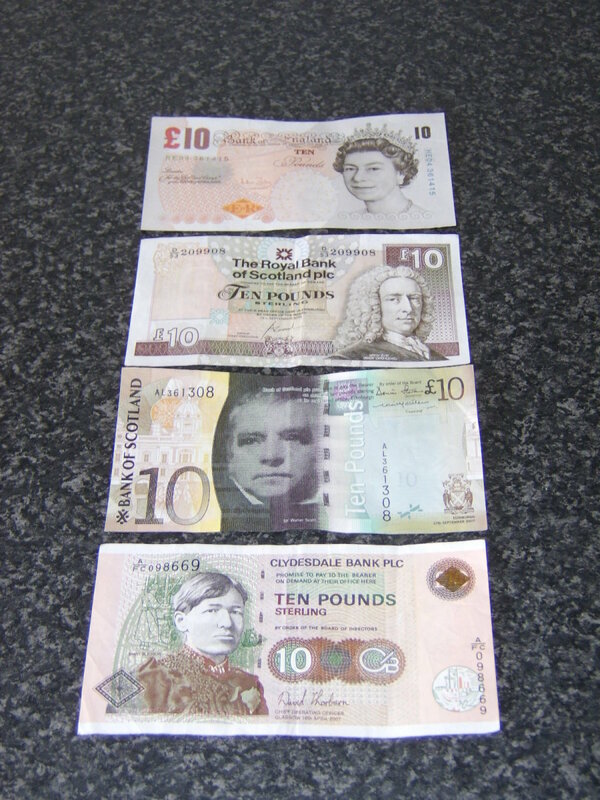 The currency in Scotland is Pounds Sterling, as it is throughout the United Kingdom. The difference in Scotland (and Northern Ireland) from the rest of the UK, however, is that there is more than one issuer of bank notes. The main issuer of bank notes in the UK is the Bank of England and this is one type of note you will encounter in Scotland. There are also, however, three Scottish banks which have a special licence to print their own notes and distribute them for use only within Scotland for advertising purposes. These banks are the Royal Bank of Scotland, the Bank of Scotland and the Clydesdale Bank. This can be extremely confusing for overseas visitors but it should be remembered only that these notes should not be taken outwith Scotland (unless for souvenir purposes). Problems are likely to be encountered even elsewhere in the UK and the chances of having them exchanged further afield are minimal at best. If you are obtaining Pounds Sterling (in cash) prior to visiting Scotland, try to ensure that you do not have any notes larger in denomination than £20. A lot of shops (stores) will not, as a matter of policy, accept £50 notes and visiting a bank to have them exchanged will be an inconvenience you don't need. This does not apply to travellers' cheques (checks). English is spoken in a great many countries around the world but equally there are a great many variances in the words which are used to imply certain meanings. This is never more in evidence than those differences in words used in the UK and the USA. Often, these words are simply different and no great confusion will arise but there are certain circumstances where either words which are perfectly innocent on one side of the Atlantic have a more risque meaning on the other side, or expressions can be entirely misleading. Pub lunches and pub grub are hugely popular concepts, not only in Scotland but throughout the UK. This fabulous book not only looks at some of Britain's most popular pub lunch dishes, it shows you in step by step instructions how to prepare and enjoy them yourself at home. If you are staying in a hotel or bed and breakfast in Scotland, breakfast at least is likely to be included in your price. One option which you will almost always have in this respect is a full, fried Scottish breakfast. 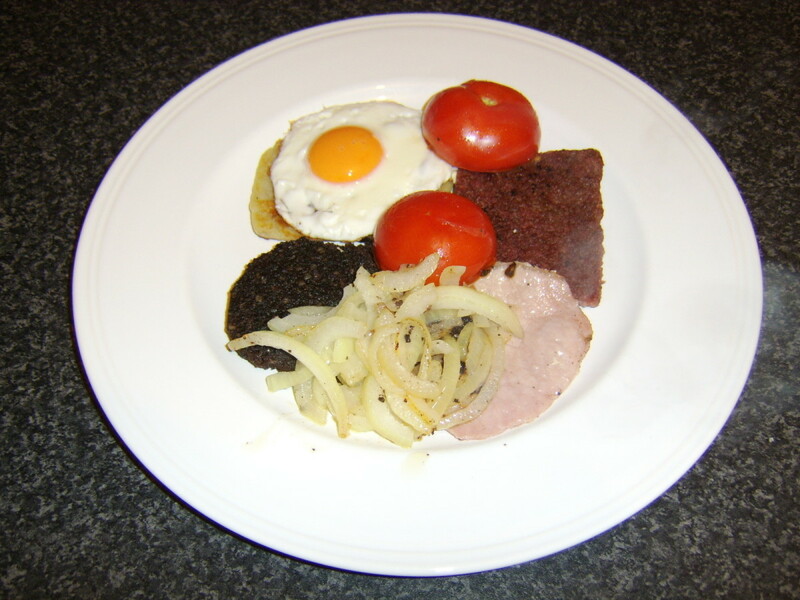 This is similar to a full English breakfast but the sausage you are likely to be offered will be a Lorne sausage, a type of sausage where the meat is compressed in to large blocks and sliced, rather than being stuffed in to a skin. You are also likely to be given a tattie (potato) scone, as opposed to fried bread or hash browns. Both are delicious and more than worth trying. Lunch and dinner may both be at your discretion, dependant on your accommodation deal. There will be a variety of restaurants or hotels at which to sample dining of various types and ethnic origins but why not try a traditional Scottish pub lunch? This is a hugely popular option in Scotland, is usually much cheaper than a restaurant and the food is more often than not very good. Try to avoid the big chain pubs, however, and go to the privately owned establishments, where you are much more likely to experience real, Scottish home cooking. If you are looking for haggis, you may well find it; but why not try something less well known that Scots eat on a regular basis? Steak pie is not just for New Year, it is eaten and enjoyed by Scots all year round. 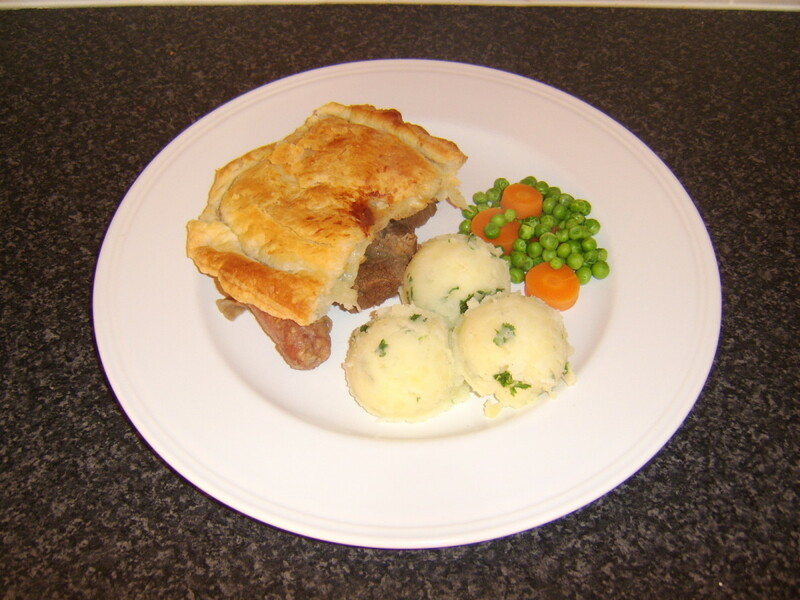 Delicious succulent steak and sausages in gravy, topped with crispy and golden puff pastry. Unless you happen to be vegetarian, this is a must try during your Scottish vacation. Although some of the big American fast food chains have established a presence in Scotland over recent years, fish and chips - the traditional British classic - still remains Scotland's favourite. 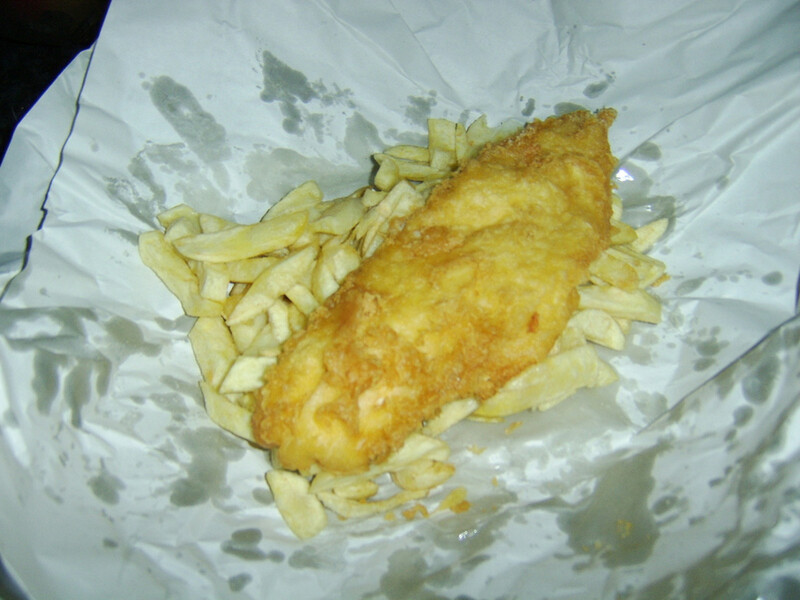 Unlike the remainder of the UK, however, takeaway fish and chips in Scotland is likely to be referred to as a Fish Supper. It is traditionally comprised of a fillet of white fish (usually haddock in Scotland) dipped in a flour and water batter and deep fried in beef fat, though oil is often used instead of the beef fat in slightly more health conscious times. The chips are simply sliced and chopped potatoes, similarly fried. Salt and malt vinegar are the favoured seasonings. The pub is a mainstay of Scottish society. It is a gathering place for friends and families, it is a place for playing pub games such as pool or darts and it is a place for watching live sports such as football (soccer) and horse racing. Scottish pubs which tend to be frequented only by those in local, urban communities will be likely to serve little other than the tap beers of the brewing giants and common blended whiskies and other spirits. In the major cities, however, and in popular visitor areas, you will find a wealth of Scottish beers and malt whiskies for your tasting pleasure. There are some points, though, which should be carefully noted and remembered, if potential difficulties are to be avoided. Scottish beers will vary hugely in terms of ABV and may be considerably stronger than the beers you are used to at home. This is worth checking in each instance prior to acquiring a taste for a particular brew. 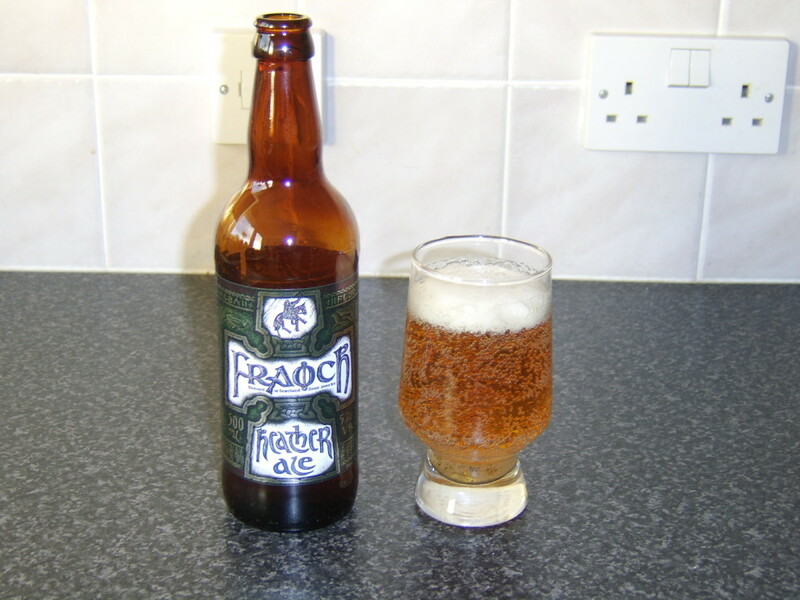 Scottish beers are usually served in pubs by the pint. Although a fluid ounce in the British imperial system is similar to that in the American system, a British pint is comprised of twenty fluid ounces, rather than sixteen. It is therefore entirely possible that you could be drinking a beer which is stronger than you realise, in quantities approximately 25% greater than you realise. The dangers and potential consequences here are probably self-evident. Particularly where you are in a pub which specialises in single malt whisky, the prices of the drams (measures) are likely to vary significantly. Rare single malts, perhaps where the distillery is no longer in operation, can be beyond expensive and careful check should be made of the prices before ordering. If you are travelling to Scotland with children, it is likely that your offspring will have some vacation expectations and requirements of their own. While many of the multi-national products such as Coke, Pepsi and Mars Bars can be found in Scotland, there are equally those products unique to Scotland which are more than worth trying and a couple of options are pictured to the right. Candy in Scotland is referred to as sweets, or sweeties in some areas. A traditional Scottish offering in this respect is the Lees' Macaroon Bar. This consists of a sweet, creamy fondant, coated in chocolate and rolled in toasted coconut. 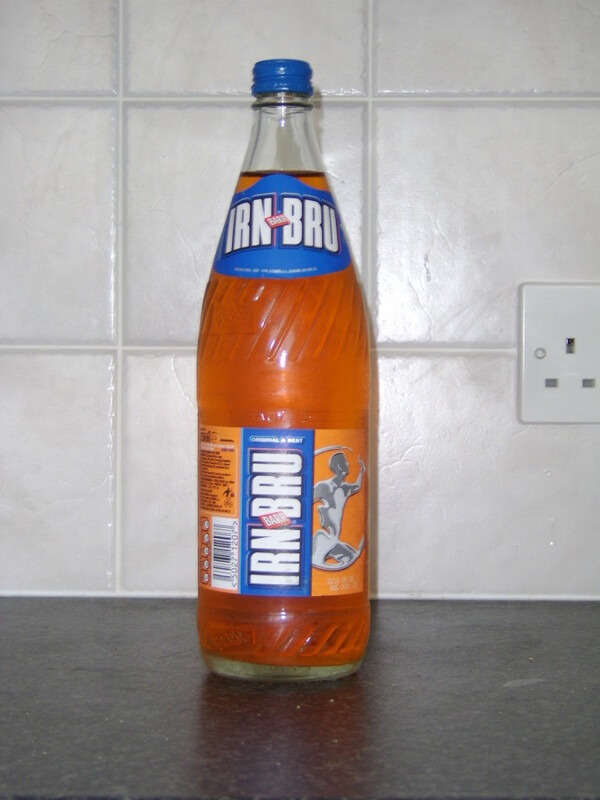 The most popular soft drink in Scotland is the legendary Irn Bru. The precise recipe for Irn Bru is known only to two living people at any one time, with back-up details in a Swiss bank vault. 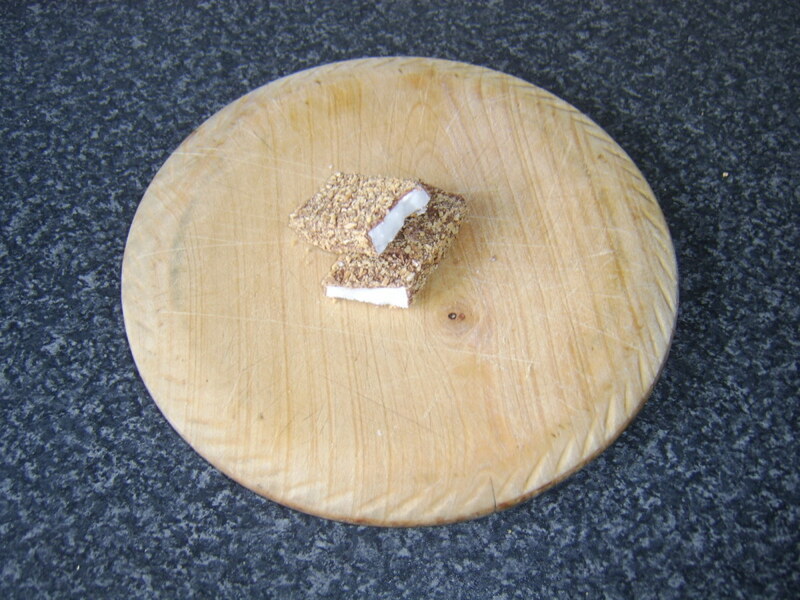 The taste is extremely difficult to describe or compare and is definitely something for all the family - not just the kids - to try during a Scottish vacation. Note that Irn Bru is a perfect and traditional accompaniment to a fish supper. There are many wonderful souvenirs of Scotland which it is possible to purchase to take home with you as a permanent reminder of your Scottish vacation. Craft shops, woollen mills and of course dedicated shops selling, "Liquid," reminders of Scotland can be found in most areas commonly visited by those on holiday or vacation from overseas. 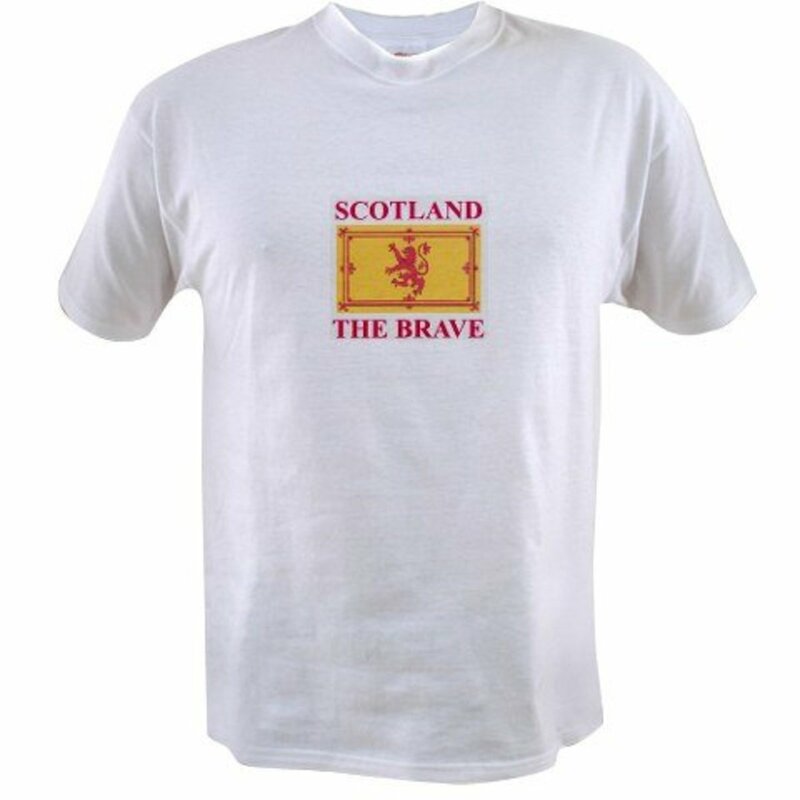 Sadly, however, it is a sign of the times that there are now more than ever those less scrupulous outlets in Scotland, selling allegedly Scottish souvenirs which have been mass produced in places such as Taiwan or Hong Kong at a tiny fraction of the price for which they are subsequently sold. There is no foolproof way of avoiding the fake, substandard souvenirs but in most instances, careful consideration of the outlet in which the product is sold, careful examination of the product and even pertinent questions asked of the sales assistant can go some way to ensuring that you are really getting the quality and authentic merchandise you are paying for, expect and deserve. Lost your Passport? Need to Speak to Your Embassy in the UK Urgently? Below are the emergency contact numbers for some of the major embassies in the United Kingdom. 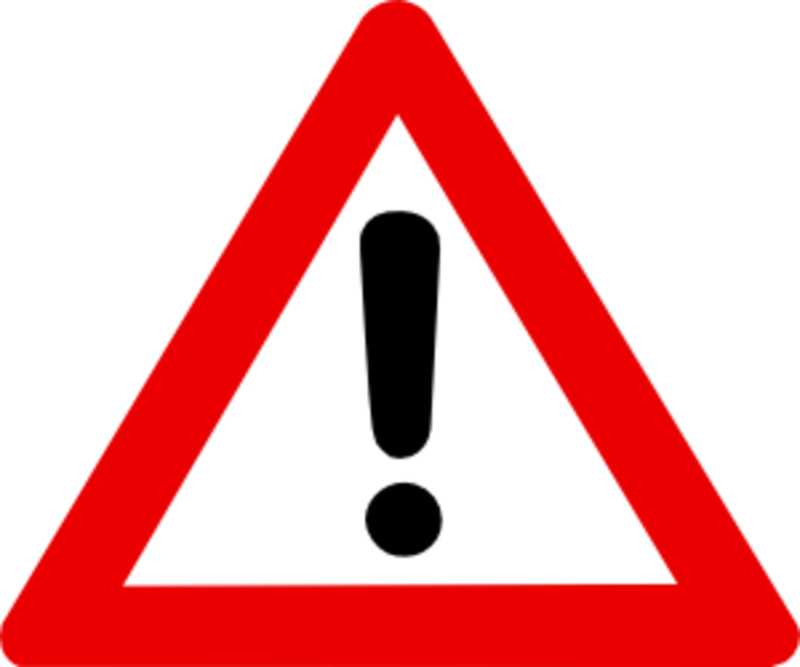 Limited consular services can be found in Edinburgh but the London embassies should be contacted in emergencies. These numbers appear as they should be dialled from within Scotland or anywhere else in the UK. Thank you - and I hope the information ultimately proves useful to you if you choose to arrange and make your own visit. 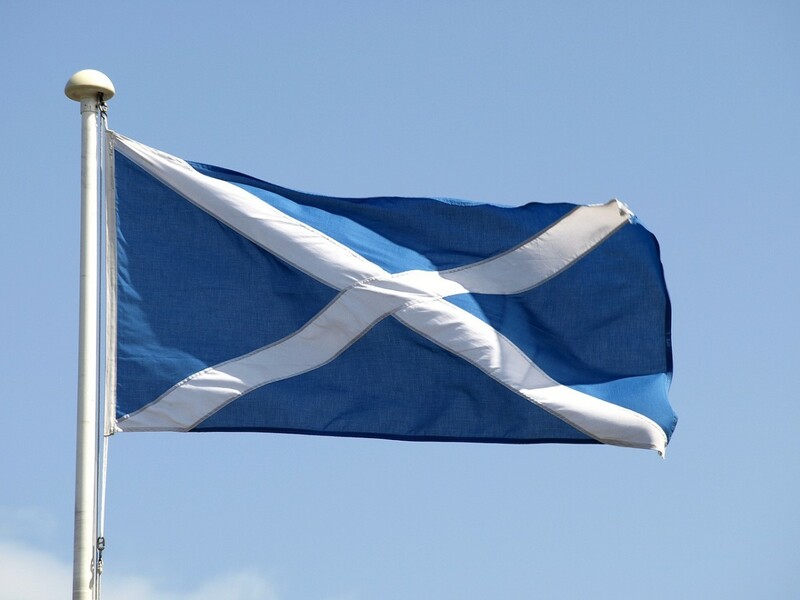 Thank you for all the Scotland info. It was excellent! Impressed with this lovely country. This is a very comprehensive guide on Scotland. I like the way you organized it. Hello, Kathleen. I'm really glad you enjoyed your tours of Scotland and the rest of the British Isles. 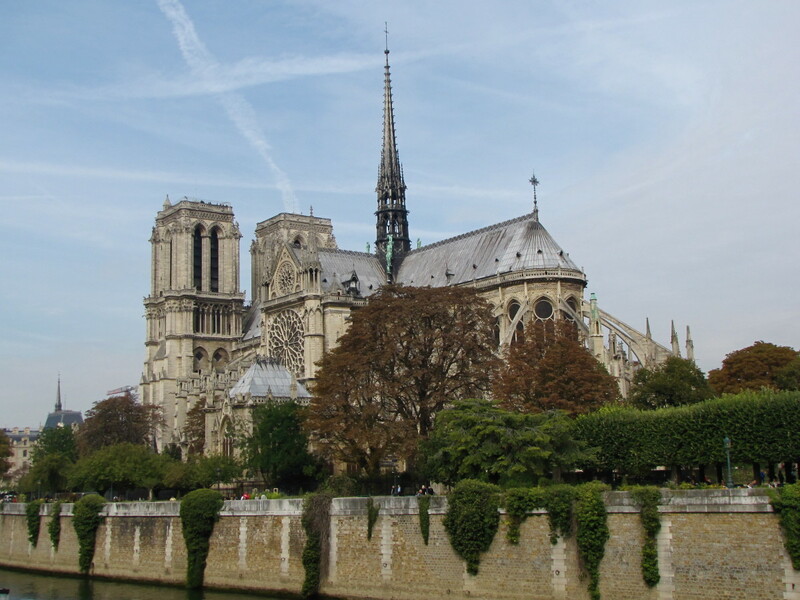 I hope you get the chance to visit again. Perhaps we are distant relatives if Hamilton is one of your family names? Thanks for visiting and letting me know how much you enjoyed your experiences. Loved, loved, loved my tour of Scotland with CIE Tours. Instead of wandering around, I wanted to hear all the history and customs and legends of my ancestors on both sides of my family, Cochrane's and Hamilton's. CIE is also who we used for Ireland, England and Wales. Can't say enough good things about their guides, the sites chosen, and the pace of the trip. We started with Aberdeen to see Dunnotter Castle. Nothing compared. I could add a few more tips but you would then go in to overload. I would remind you also that dialects change just about every 10 miles or so as they do in England. But as a Scot I would commend what you have written and congrats to you on a good piece. Thanks very much Darshan. I hope you manage to visit Scotland on your next trip to the UK. One of the best hubs I have come across till now,Gordon. I was in London during 2013 and Scotland was on the top of my bucket list. However it did not happen. 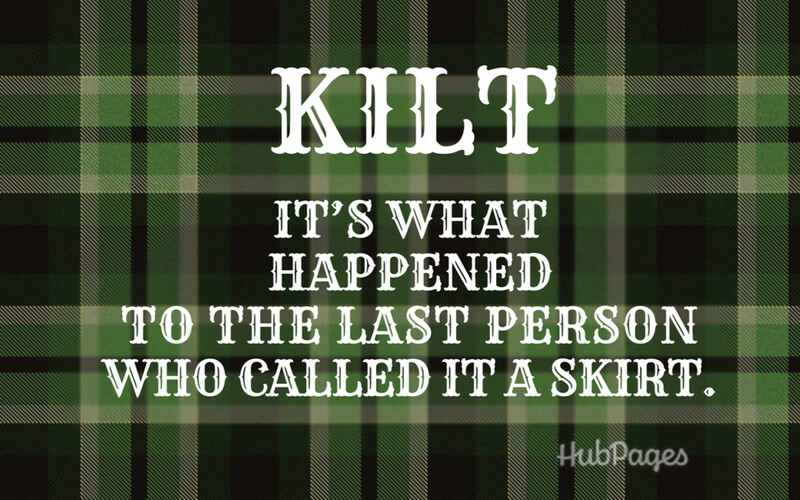 But after going through your blog, I find more reasons to visit Scotland. Thanks for the awesome hub. Loved this hub! I lived in Scotland for a year and it was amazing! Beautiful place. Best fish and pubs in the world! I wasn't a fan of Iron Bru though lol. Hello, Christine. Apologies for the delay in replying to your comment. Lanark is very close to where I live at the moment and I was actually in the town just a couple of weeks back. It is a beautiful little town, packed with history. I hope you get the chance to see Scotland for yourself some day and see the home of your ancestors in person. Thanks for visiting and commenting. Great Hub! I recently traced my 4x gr grandparents back to Anderston, Barony, Lanark, Glasgow on the 1841 Scottish Census. Prior to that they were in Co. Antrim, Ireland. I love reading about both Scotland and Ireland. Thanks for the view into present day Scotland. Ah, you're stirring my mind! God, I'd love to travel to the Isles. My eldest daugher wants to travel there, as well. Maybe she will beat my wife and I there. At any rate, I'm going to view more of your stories and enjoy from a great distance. Well done, Sir. Well done, indeed! Thank you for visiting and commenting, travellingjo. 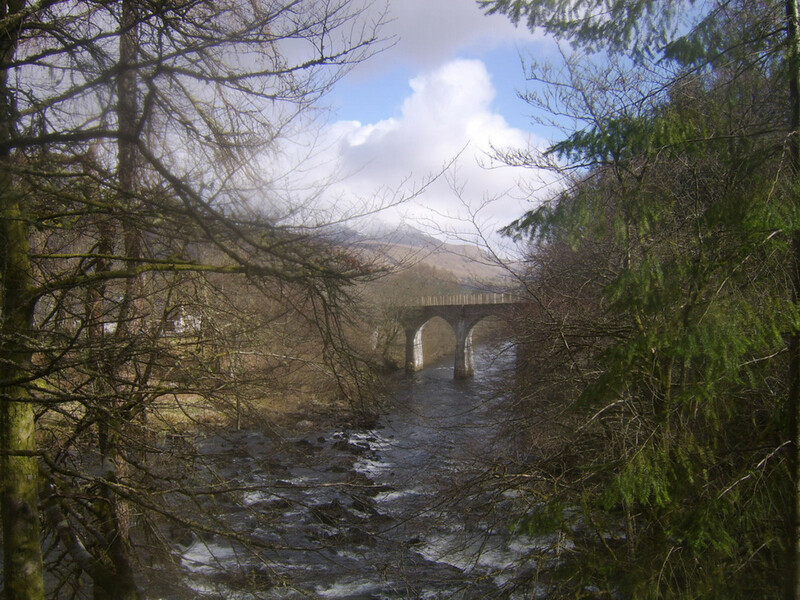 I hope you have a wonderful time when and if you visit Scotland and that these glimpses of day to day life help you appreciate the more widely known scenic beauty. Hello Gordon. What a great hub. 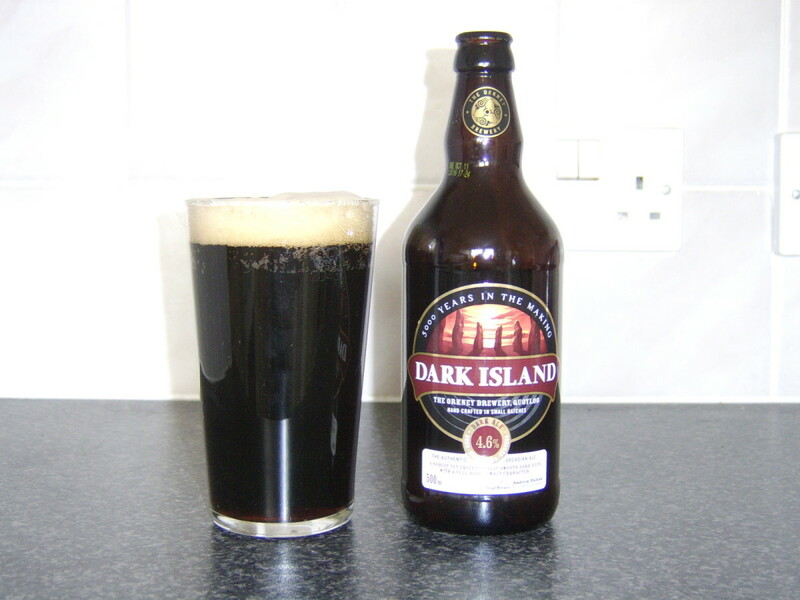 The Orkney dark looks delicious. Very informative. Thank you. Thank you, Dardia. I am glad that you enjoyed reading this Hub and hope that you have the opportunity to visit Scotland for real some day. Wonderful hub. I enjoyed it very much almost as much as I would if I had had a chance to see it for myself. Thank you for making my vacation to Scotland possible. Glad you found it useful, texusgirl. I hope that you have a wonderful time when you get here. Fantastic travel info! A friend and I are planning on traveling to Scotland and this helped a bunch. Thank you, htodd. I hope the information may prove useful to you some time. Weather seems to be on the up here so hopefully will be a good summer. Three weeks on Wednesday until I head up North to check the state of the fishing! Good hub and really useful info. I'm hoping this year to get up there, mind you said all last we were going to too. Thank you, Simone. I hope it does help people to see the real Scotland in advance of their trip and allow them to plan to enjoy themselves to the full. Oh. My. GOSH Gordon Hamilton. 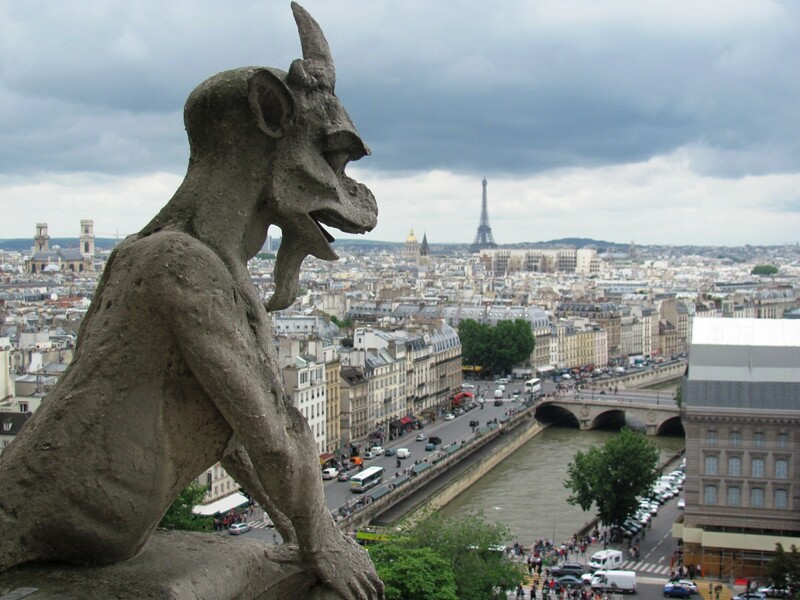 You really are a pro with travel guides! This is awesome -and incredibly useful too! Voted up!! Bravo!! Now I just REALLY need to go to Scotland! !